« Baby Boomer Health: Brush Up on Your Daily Dental Routine! Root canal. Two words that historically strike fear in the hearts of most dental patients. But that shouldn’t be the case any longer. 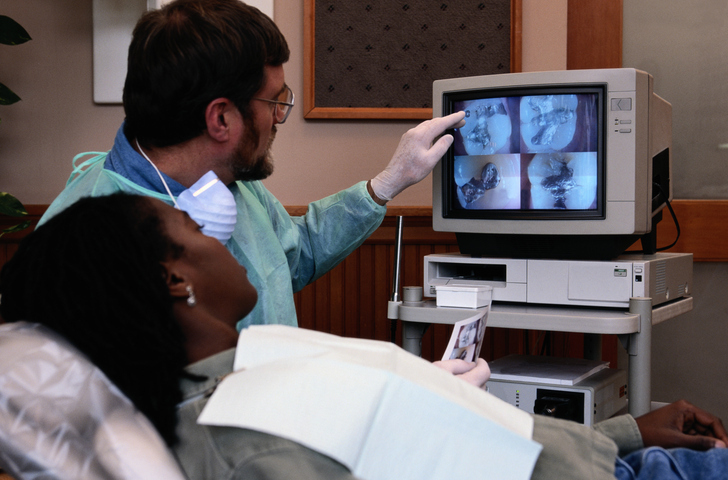 Modern dental tools and technology have made root canal surgery quick, nearly painless, and well, almost root-ine. When people talk about “root canals,” they’re really talking about a root canal surgery or treatment. A tooth’s root canal is the natural cavity within the center of the tooth. The canal holds the tooth’s nerve, along with the soft, spongy pulp that fills the center of the tooth. Root canal surgery, or treatment, is required to save a tooth that has badly decayed or become infected. When a tooth’s nerve tissue or pulp is damaged (usually due to deep decay, injury, repeated dental procedures on a single tooth, or a large filling) it breaks down, allowing bacteria to multiply inside the tooth. The bacteria may cause an abscess to form past the roots of the tooth, and can result in swelling that may spread to other areas of the face, neck, or head or even bone loss around the tip of the root. What Are the Signs You Might Need It? What Can I Expect When I Go in For Root Canal Treatment? The first step in the procedure is to take an X-ray. This will allow the dentist to view the shape of the root canal(s) and determine the difficulty of the procedure. It will also show any signs of infection in the surrounding bone. If the infection were allowed to spread, it could lead to deterioration of bone or dangerous – possibly fatal – internal infection in the blood, tissue, or organs. Next, the area around the tooth will be anesthetized. Believe it or not, anesthesia is often not necessary, since the nerve is dead. But most dentists still anesthetize the area to make the patient more relaxed and at ease. To keep the area dry and free of saliva during treatment, your dentist will then place a rubber dam (a sheet of rubber) around the tooth. After this, he or she will drill an access hole will into the infected tooth, then use a series of root canal files (similar to tiny, thin drill bits) to remove the decayed pulp and nerve tissue, along with the infection-causing bacteria. During and after filing, water or sodium hypochlorite is used periodically to flush away the debris. Once the tooth is thoroughly cleaned, it is sealed. Some dentists like to wait a week before sealing the tooth, especially if there if there is an infection. Others may choose to seal the tooth the same day it is cleaned out. As a general rule, if the patient is experiencing pain, tenderness, or swelling at the time of their appointment, the dentist will be less likely to choose single-visit treatment. Also, your dentist will be more likely to choose a multi-appointment approach if your treatment is more complex; for example, if the affected teeth that have multiple root canals (molars) or the root canal is difficult to access or negotiate. If the root canal is not completed on the same day, a temporary filling is placed in the exterior hole in the tooth to keep out contaminants like saliva and food between appointments. Until the treatment is completely finished (by filling or crown), it’s a good idea to minimize chewing on the tooth. This will help avoid re-contamination tooth’s interior and may prevent a fragile tooth from breaking before it can be fully restored. After the canal is filed and flushed, the interior of the canal and tooth is filled with a sealer paste and a rubber compound called gutta percha. The access hole created at the beginning of the treatment is capped with a filling. If the tooth abscessed as a result of damage caused by a large filling or extensive decay, it may also require a crown. Your dentist will discuss the need for any additional dental work with you. For the first few days after root canal treatment, the tooth may feel sensitive. This sensitivity or discomfort usually can be controlled with over-the-counter pain medications. Most patients can return to their normal activities the next day. What Does Root Canal Surgery Cost? Costs vary, depending on the complexity of the treatment. But generally speaking, you can expect root canal treatment to cost between $385-$1,200 depending on the complexity of the case and the insurance plan. Also, if the tooth requires a crown, that would be an additional cost. Many dental insurance plans cover at least part of the cost of the procedure, but be sure to consult your carrier for coverage details. If you think you may need root canal treatment, don’t delay! Schedule a visit with Dr. Wolnik at (440) 888-5055, or book an appointment straight from our website (click on the green “Book an Appointment” button). This entry was posted in Dental Services, Dr. Kenneth J. Wolnik, Expert Dental Advice, Frequently Asked Questions, General Dentistry, Tooth Loss and tagged Root Canals. Bookmark the permalink. Follow any comments here with the RSS feed for this post. Both comments and trackbacks are currently closed.